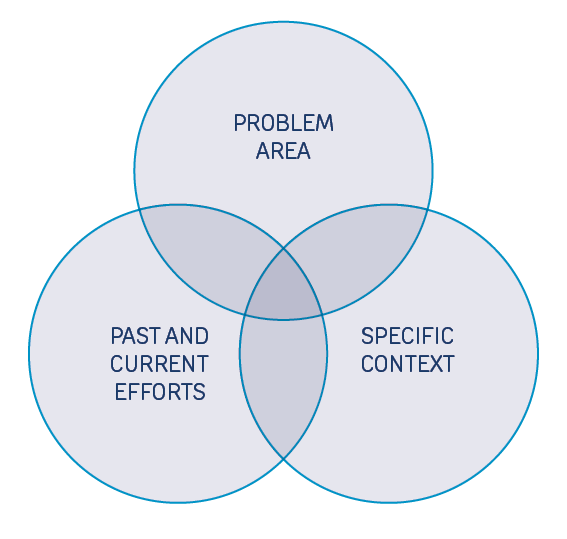 We base our understanding of a problem by developing three relevant ‘Knowledge Areas’. Information regarding the nature, scope, and complexity of the problem. What do you need to know about the factors that improve or worsen health conditions for your target group? What are the relevant sectors that engage with this issue? What are the other operational factors that might help or constrain the ability of relevant actors to provide health assistance? Information regarding the context and operational environment in which the problem exists. What do you know about the political, economic, demographic, technical, and sociocultural systems involved? What do you know about the stakeholders or actors involved (eg, government, armed actor groups, UN agencies, CBOs and NGOs, municipal service providers, or politically, ethnically, or religiously affiliated communities)? What do you know about security conditions and other relevant factors that might drive opportunities or constrain potential actions? Information regarding existing solutions and ways of addressing the problem. Which, if any, organisations, government institutions or private sector actors are currently trying to address the problem? What solutions are they using? What other actors are involved in this problem? What roles do they play? What tools, methods, and practices are used to carry out tasks and activities associated with the delivery of programmes or services to address this problem? How are the affected communities involved? What works, and what doesn’t seem to be working? Assessing past efforts or existing services also includes information about the specific kinds of users and target groups to be served, and the particular needs they encounter, and that must be resolved or addressed. While many different kinds of users can likely benefit from the products and services that characterise innovative solutions, setting out to be useful to everyone can lead to a lack of focus, and therefore deliver a lack of value. Identifying target users and their needs helps clarify, guide and prioritise the selection and generation of other kinds of information. Whatever the approach, and whatever the information product, you will have to develop a set of research questions to guide your search, before you go off and start downloading reports, requesting interviews and visiting field sites! Having good research questions helps you focus on what information you really need and stops you from wasting time and effort. Once you’ve got your research questions, there are a number of ways you can acquire the information you need. At this early stage, it might be helpful to first think about types of research so that you can hone in on the kinds of research questions that will guide your investigation. There are three types of research (exploratory, explanatory and evaluative – the ‘three E’s’) but for our purposes we will focus only on exploratory and evaluative research and the kinds of questions that are asked in those types of investigations. The purpose of exploratory research is to generate initial ideas that will lay the groundwork for future investigation – it focuses on the discovery of ideas and thoughts. This kind of work involves making observations, describing phenomena, and identifying relevant factors or variables. It often involves taking well-defined theories, practices, or methods and applying them to a new context to see if they hold up. Or sometimes, it consists of developing entirely new theories, ways of looking at, or measuring things. Exploratory research is great for initial, descriptive investigations that consider multiple aspects of a particular problem or context. Exploratory research goes hand in hand with descriptive research, which are attempts to describe contexts, people, interactions, events, etc. What are the ways in which humanitarian organisations provide refugee education in urban environments? What are the main factors that contribute to a community’s resilience to adverse weather events? How are humanitarian organizations adapting GBV interventions from rural to urban settings? The purpose of evaluative research is to assess the impact of a particular programme, intervention, or services – to measure the outcome(s) in terms of changes in social conditions, organisational effectiveness or efficiency, etc. How were rural communities affected by changes in mobile connectivity regulations? Note: Knowing the differences between these types of investigations is important because the approaches, methods, activities, and exercises in this module will encourage you to formulate, frame, and try to answer multiple types of research questions! We will also make use of these approaches at various stages in the Recognition and Pilot phases. Desk research refers to searching for, collecting, and assessing information that has already been produced by others, or what we would call ‘secondary data’. This can be done remotely, via laptop and internet, or on site, by collecting and reviewing hard copies of reports, strategies and other printed reference materials. Carrying out desk research can yield valuable information from NGO reports, peer-reviewed studies, case studies, policy papers, technical papers, operational strategies, programmatic evaluations, long-form news media, and even statistical indices, open-source databases, maps, and documentary films. Carrying out interviews during the Starting Point Assessment phase of your journey is not meant to generate in-depth knowledge regarding the problem you are investigating, or the kinds of user-requirements insights that might be used to develop solutions. Instead, interviews used here are more like conversations, preliminary discussions, or brainstorm sessions to help set the scene and point you in the right direction. As such, interviews are part of a process known as ‘rapid inquiry’. Finally, direct observations are a great way to rapidly learn about a particular problem and/or opportunity. Again, the point is not to commit yourself to an in-depth immersion programme or participatory action-research. The point is to get a rapid sense of the landscape that you will step into and to stimulate learning around the way that users experience an existing service, or carry out their day-to-day work (see ‘Observe the problem’).